Ah, to be king for a day! If, like most of us, you weren't born into the royal lineage, fear not. 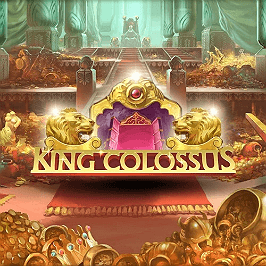 Taking a spin on King Colossus online slot provides all the perks of the job, minus those pesky responsibilities. With stacked wilds, re-spins and 40 paylines, every spin of the reels has huge potential to net a big win. Perhaps you're just a turn away from living the lavish life! Play King Colossus for Real Money! As mentioned, there is potential to pick up multiple wins per spin, so accumulating a profit is quite possible. 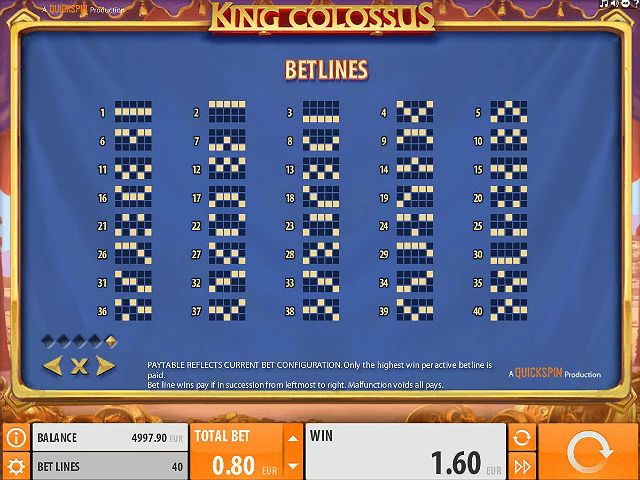 The King Colossus slot game features 40 paylines: a number set in stone. This means players have fewer options when it comes to modifying their stake amount. Instead, however, you can use the total bet function to edit your wager from 0.40 to 120.00 per spin of the reels. What's more, QuickSpin have made it easy to zip through plenty of spins as quickly as possible – truly living up to their namesake. There is also the option to use Autoplay (10-1000 spins at the same bet per line each time), and highlight the fast forward button to bring each spin to a rapid conclusion. Lastly, you can choose to activate your keyboard when playing on desktop or tablet devices. This allows you to press space bar to spin the reels rather than having to click the spin button. 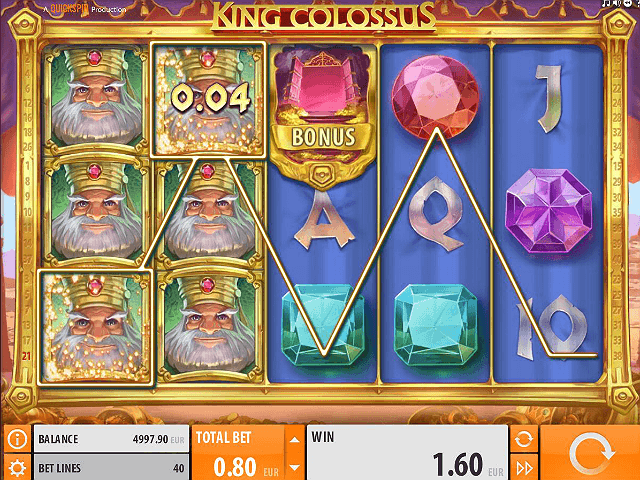 The King Colossus online slot features not one, but two wild symbols. The first, which is termed the regular wild, is a lion’s head on a green background. This substitutes for all other symbols apart from the other wild and the +1 spin icon (more on that shortly). It also pays a huge 15.00, 90.00, 300.00 and 1500.00 for matching two to five on your reels. The second wild is known simply as the bonus, and is depicted with a lion’s head on a red background. This appears solely in the free spins feature, and two will line up in random positions on reels 1 and/or 5 on each turn. So how do you trigger the free spins round? Just reveal three or more of the scatter symbol. Here, the +1 spin symbol will (hopefully) reveal itself, adding extra free spins to your allotment, while the King himself expands to form a 3x3 block on reels two, three and four. This could be your ticket to the high life! 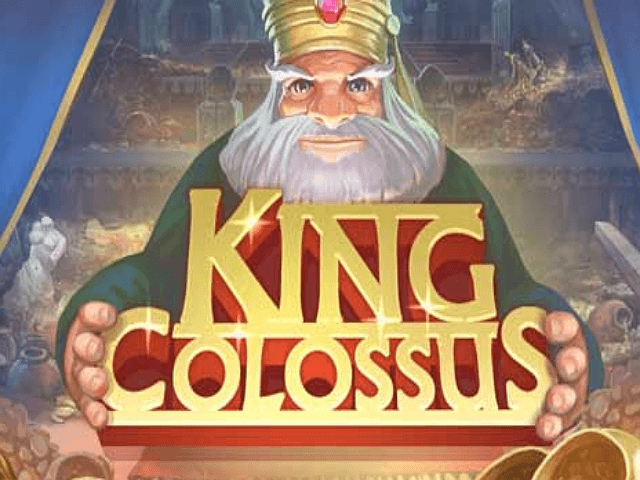 Share this King Colossus Review today! 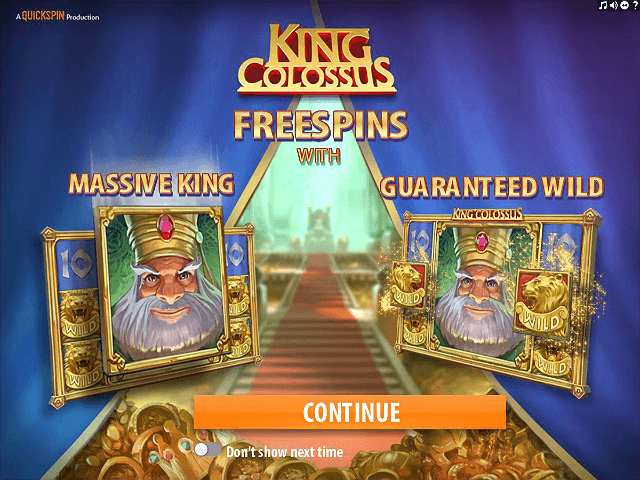 If you like King Colossus, you'll love these slot titles too!